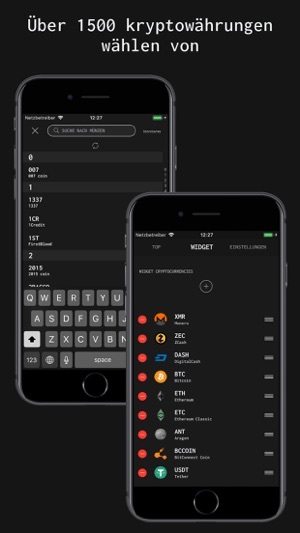 This app displays and monitors latest prices of top 100 most valuable cryptocurrencies. 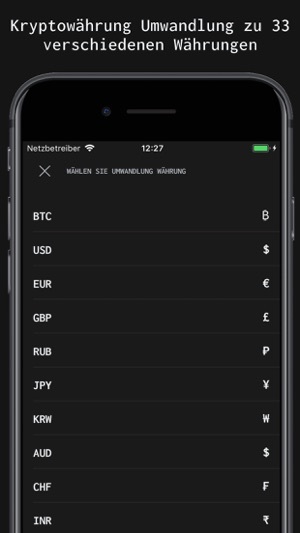 Bitcoin, Ethereum, Ripple, Litecoin, Ethereum Classic, Dash, NEM, IOTA, Monero, Stratis, BitShares, Zcash, EOS, BitConnect, Steem, Waves, Veritaseum, AntShares, Gnosis, Bytecoin, Golem, Siacoin, Iconomi, Dogecoin, Lisk, Augur, Tether, Stellar Lumens, MaidSafeCoin, Byteball, Factom, Decred, Status, GameCredits, DigiByte, Komodo, Ardor, MCAP, DigixDAO, PIVX, TenX, Basic Attention Token, Bancor, Nxt, SingularDTV, BitcoinDark, Aragon, SysCoin, MobileGo, FirstBlood, Ark, Peercoin, Lykke, Edgeless, LEOcoin, FunFair, Ubiq, Nexus, Verge, Round, ReddCoin, DECENT, Asch, Emercoin, MonaCoin, Namecoin, Melon, Soarcoin, CloakCoin, Numeraire, Wings, DubaiCoin, Storjcoin X, LBRY Credits, Peerplays, iExec RLC, Xaurum, Etheroll, Omni, BitBay, Gulden, vSlice, Counterparty, Quantum Resistant Ledger, OBITS, Elastic, ZCoin, Storj, Synereo, BlackCoin, Quantum, SIBCoin, Skycoin, PotCoin, YbCoin, Humaniq, Viacoin, Blocknet, Mysterium, WeTrust. 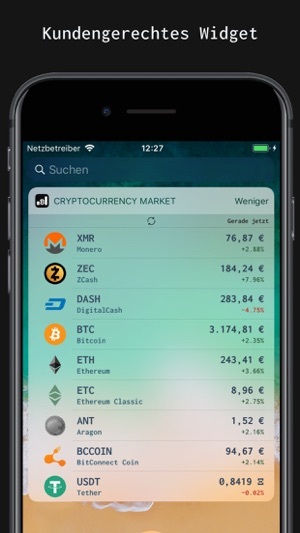 Ich hab mir die App eigentlich wegen des Widgets gekauft, das funktioniert auch so weit. 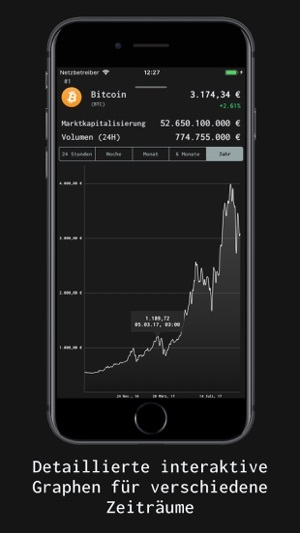 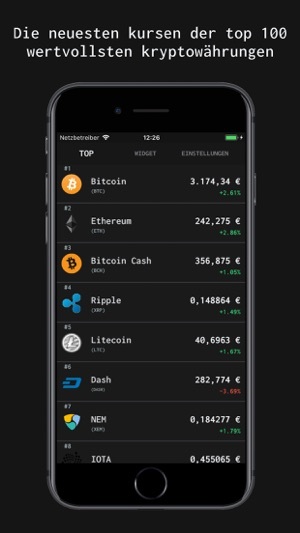 Leider aber wird bei IOTA im Widget nicht der richtige Kurs angezeigt, in der App selbst schon.